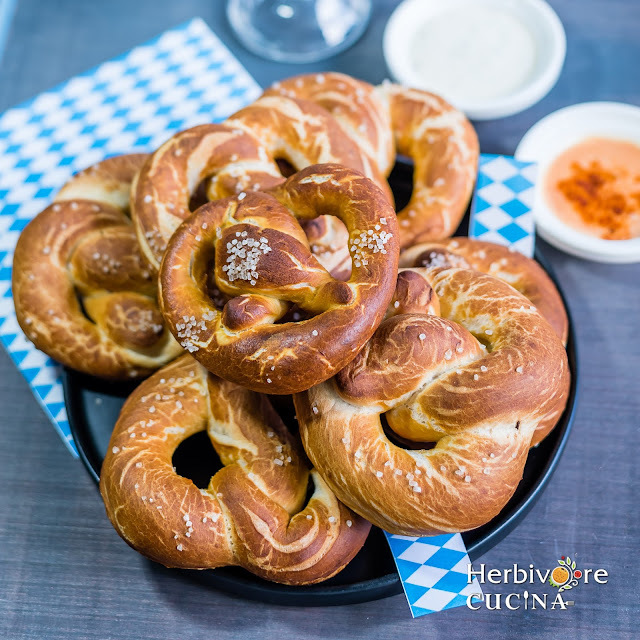 Soft Pretzels; a signature German recipe with a golden brown crunchy crust and soft interiors, this is a MUST-HAVE for Oktoberfest! 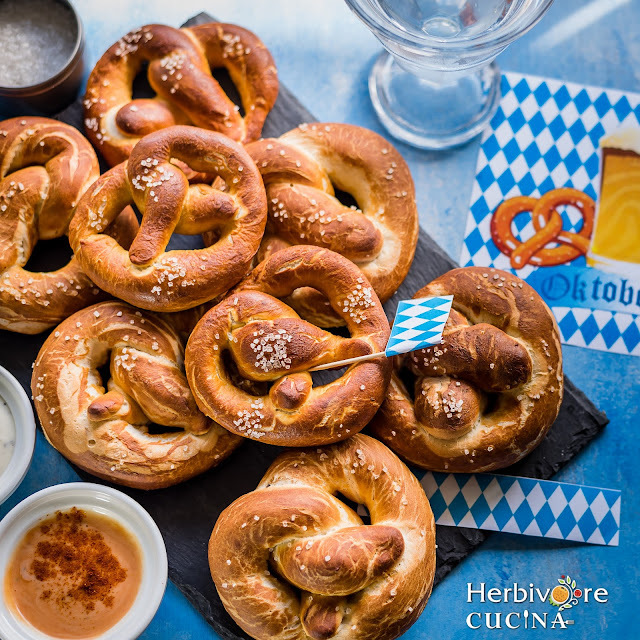 Oktoberfest is here and everyone needs a good German Pretzel recipe with the chilled beer. 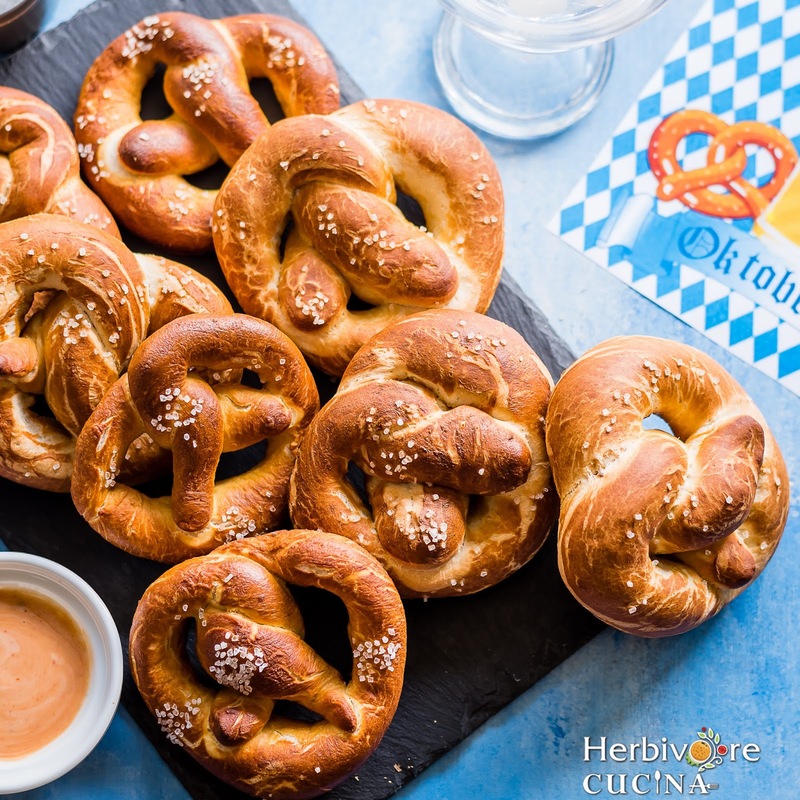 Even if you are a teetotaler or do not celebrate Oktoberfest, pretzels are perfect for tailgating parties, a casual snack or an appetizer. 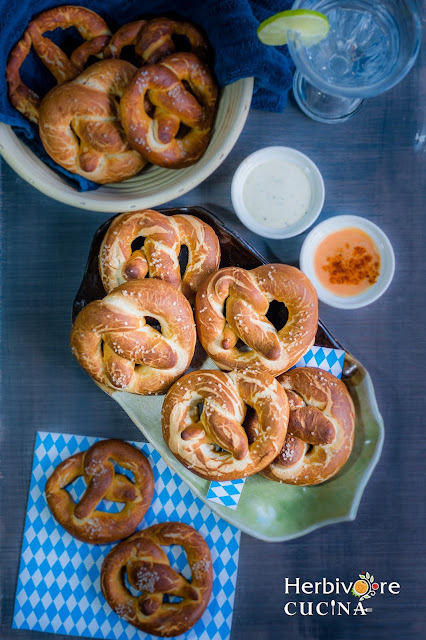 Served with a variety of sauces, these soft pretzels are actually super easy to make. I have had pretzels in many places and not liked them. However, the first time I fell in love with them was when I tasted them at a German Restaurant in Boston. The perfectly golden crust studded with sea salt that gave way to the softest insides I have ever tasted. And they served it with a SPICY Ranch sauce that made me love every bite of the appetizer. Since then I have been wanting to make them at home and have a dozen. But again, just like bagels; these need a soda bath to get the crust and I was super unsure of how it would go. Finally, when our lovely hostess for this month Wendy who blogs at A Day In The Life On The Farm selected the theme International Breads; I HAD to make this one. I was still doubting the outcome and sat in front of the oven watching the pretzels brown. If only I had taken a time lapse of the whole thing! The pretzels came out PERFECT, golden and crisp on the outside and super soft inside. I served these with sriracha based buttermilk ranch sauce and it was a perfect combination. This is the world's largest Beer festival and travelling funfair. Celebrated annually in Bavaria, Munich and Germany, this folk festival sees over 6 million attendees each year. This festival is generally celebrated for 16 days; the last day being the first Sunday in October. In 2017 it begins on September 16, now just 4 days away! The visitors to the festival enjoy a variety of things like BEER, amusement rides, side stalls and games. There is also a wide variety of traditional foods including roast chicken and pork, grilled ham hock and fish, sausages, pretzels, potato or bread dumplings, cheese noodles, potato pancakes, Sauerkraut or red cabbage and Bavarian delicacies as spicy cheese-butter spread and white sausage. [source: Wikipedia]. So given how popular Laugenbrezel are in Oktoberfest, I decided to make them for this month. Why is there a Soda Bath? 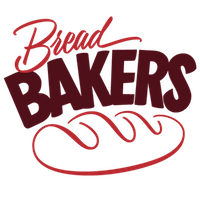 All bagels and pretzels, and few other breads seem to have a soda bath before baking. Wondering why? Without going into the details and chemical reactions, here is a simple way to understand that. If you taste a bagel and a bread, you will clearly understand how the bagel has a rubbery, crunchy top compared to the soft crumbly texture of most other breads. This signature topping comes as a result of a soda bath, a reaction that gives these bakes a distinct brown skin. Though this was something I was scared of, I tried it for the pretzels and it worked out pretty well. So it is really not as difficult as it sounds. It is pretty simple and quick. 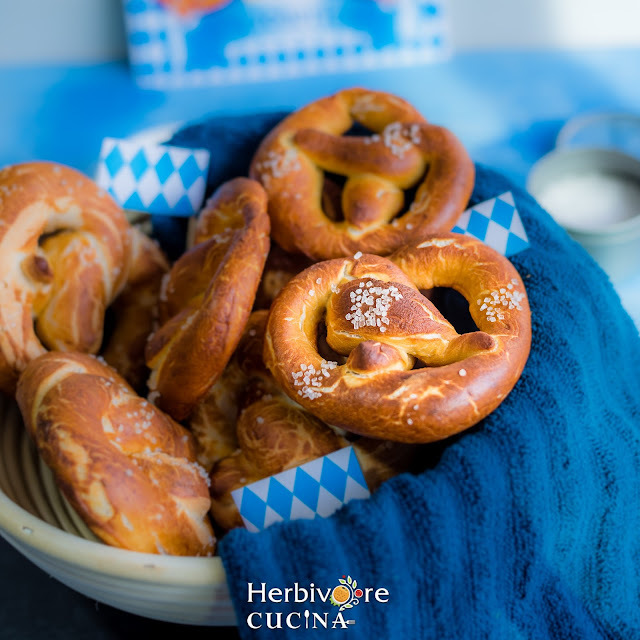 So wait no further, just head straight to the recipe and make it for the upcoming Oktoberfest, Tailgating parties or just as a snack. You will not be disappointed, I promise! In a bowl heat 1 1/2 cup water with salt and sugar. Mix well and add yeast. Let the yeast bloom for 4-5 minutes. In the base of a stand mixer or a large bowl mix together 3 cups flour, bloomed yeast and water and unsalted butter. Mix together till it comes together as a soft dough. If it is very sticky, add 1/2 cup flour. Use as much dough as required to form a smooth soft dough. Cover and let it rise for 10 -12 minutes. Meanwhile, preheat oven to 450 F/ 320 C. Line a cookie tray with a baking sheet and set aside. Also, prepare the soda bath by boiling the soda and water mixture. Keep a slotted spoon ready. Once the dough has risen, divide it into nine or ten equal parts. Using each part roll out a long rod of about 20-22 cm length. Then fold it into a knot, sealing the edges over the base. 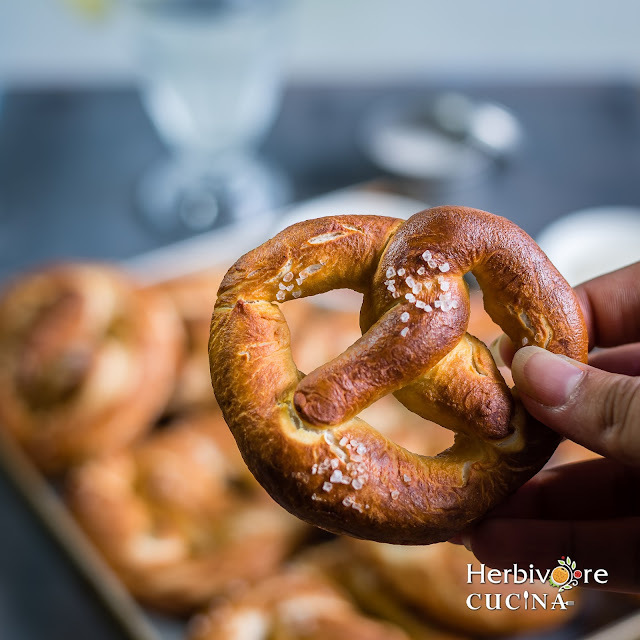 Drop the pretzel into the boiling soda bath and remove using a slotted spoon in 20-30 seconds. Leaving them any longer will give them a metallic taste. Place them on the baking tray and sprinkle coarse sea salt on them. Bake for 12-14 minutes, till the crust is golden brown. Remove and serve with mustard, ranch or a spicy ranch sauce made by mixing Sriracha sauce and Ranch dressing. Perfect choice for this season. Those pretzels look amazing!! I can often be found staring in my oven window watching my bakes! These came out so beautifully! Thanks for explaining October fest I was wondering about it. 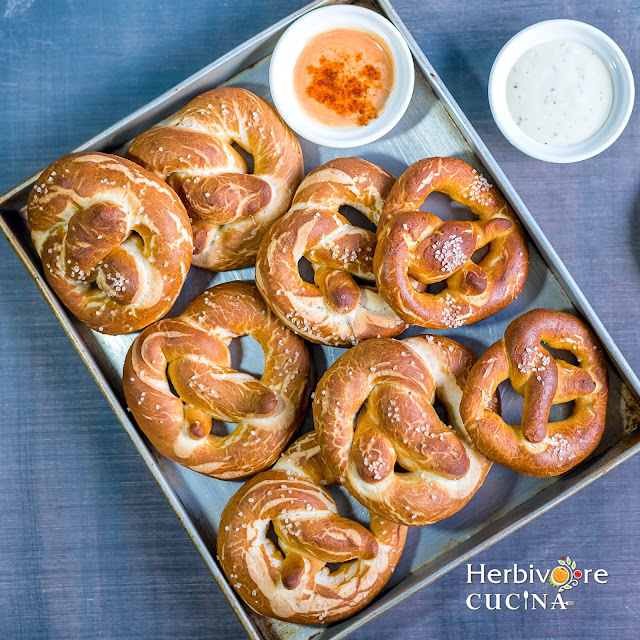 Your pretzels look amazing. 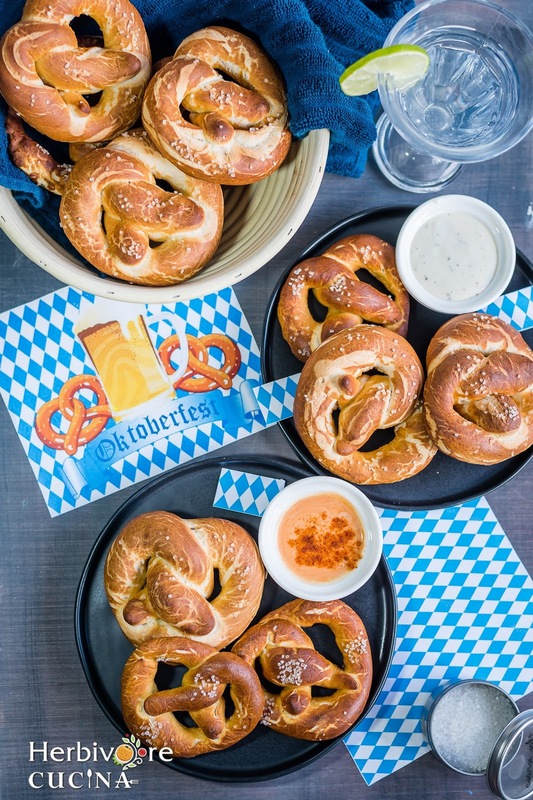 Soft pretzels and beer for Octoberfest, yea! I love the sound of that sirracha-buttermilk dipping sauce! 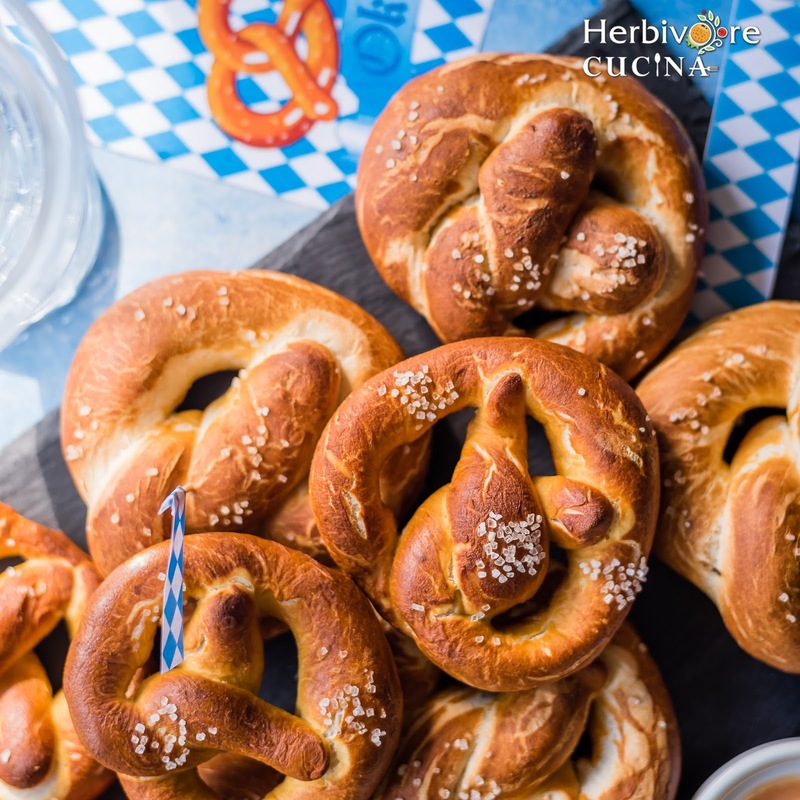 Perfect pretzels, very tempting. I didn't know pretzels were very much a part of the Oktoberfest. I thought it was just beer. Nice reading about your info on the festival. I love the extra twist you put in the middle of the pretzel. They all look just perfect! 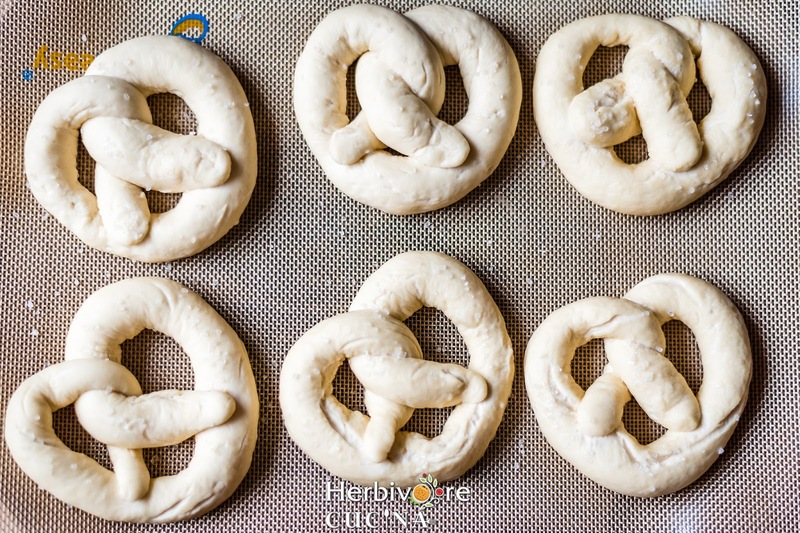 Wow Smruthi, your pretzels look so perfect -- soft and chewy. Hi, these look great! If you were having a party and wanted to prep a big batch of these, do you think they could be frozen at any point? I was thinking maybe before the boil and bake, but would love thoughts. Wow, amazing looking pretzels. This is certainly a must try recipe.